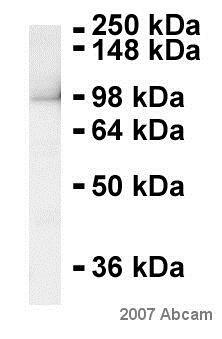 Expect reactivity against both isoform 1 and isoform 2.
, corresponding to amino acids 780-797 of Human iASPP (Isoform 1). Our Abpromise guarantee covers the use of ab34898 in the following tested applications. WB 1/1000 - 1/5000. 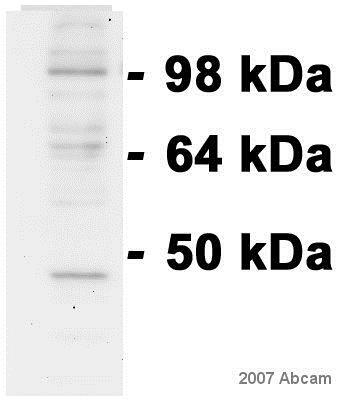 Detects a band of approximately 102 kDa (predicted molecular weight: 90 kDa). IP Use at 4 µg/mg of lysate. 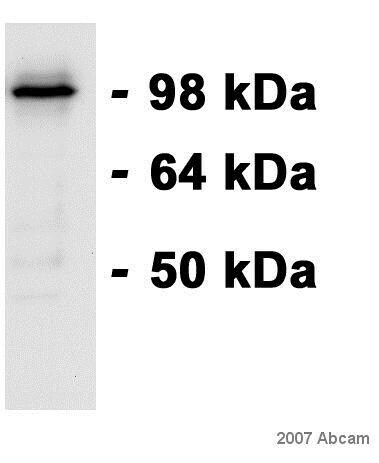 ASPP proteins (ASPP1, ASPP2 and iASPP) represent a new family of p53 binding proteins. 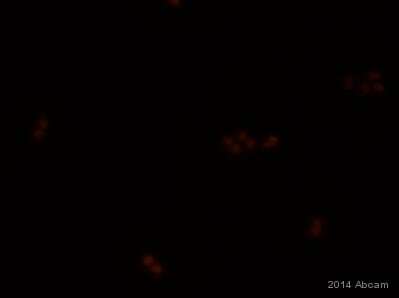 ASPP1 and ASPP2 bind and enhance p53-mediated apoptosis. In contrast, the third member, iASPP, functionally inactivates p53. iASPP (also called protein phosphatase 1 regulatory (inhibitor) subunit 13 like protein, Inhibitor of ASPP protein, Protein iASPP, PPP1R13B-like protein and NFkB-interacting protein 1) plays a central role in regulation of apoptosis and transcription via its interaction with NF-kappa-B and p53/TP53 proteins. iASPP blocks transcription of HIV-1 virus by inhibiting the action of both NF-kappa-B and SP1. This protein also inhibits p53/TP53 function, possibly by preventing the association between p53/TP53 and ASPP1 or ASPP2, and therefore suppressing the subsequent activation of apoptosis. iASPP is predominantly a cytoplasmic protein (isoform 1) but can also be found in the nucleus (isoform 2). iASPP is highly expressed in heart, placenta and prostate and is weakly expressed in brain, liver, skeletal muscle, testis and peripheral blood leukocyte. The N-terminal region of isoform 1 is required for cytoplasmic localization. 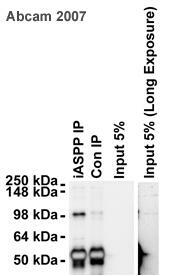 Defects in iASPP may be a cause of certain breast cancers and the protein is overexpressed in many patients suffering from breast carcinomas and expressing a wild-type p53/TP53 protein. 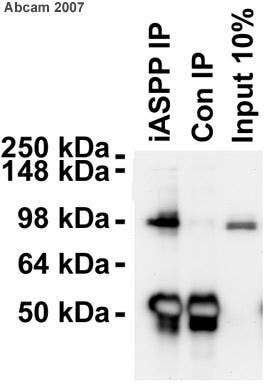 Immunoprecipitation - Anti-iASPP antibody (ab34898)Image is courtesy of an anonymous AbReview. Immunoprecipitation analysis of Human HeLa whole cell lysates. 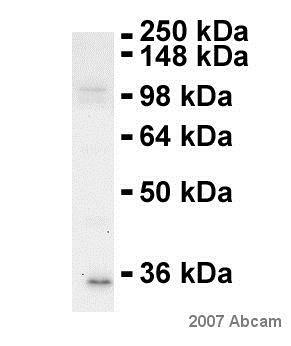 The cells were immunoprecipitated untreated with a Protein A matrix diluted at 4 µg/mg lysate incubated for 2 hours at 4°C in RIPA buffer. Lysates/proteins at 500 µg per lane. IHC image of ab34898 staining in human breast carcinoma formalin fixed paraffin embedded tissue section, performed on a Leica BondTM system using the standard protocol F. The section was pre-treated using heat mediated antigen retrieval with sodium citrate buffer (pH6, epitope retrieval solution 1) for 20 mins. The section was then incubated with ab34898, 5µg/ml, for 15 mins at room temperature and detected using an HRP conjugated compact polymer system. DAB was used as the chromogen. The section was then counterstained with haematoxylin and mounted with DPX. Publishing research using ab34898? Please let us know so that we can cite the reference in this datasheet.